The aftershocks of the 7.0 magnitude quake that hit Southcentral Alaska, while nowhere near as powerful as the initial earthquake, are strong enough to compete with initial quakes on any ordinary day, and they still haven't stopped and will remain a part of Alaska quake climate for months to come, and maybe even years, according to CNN. 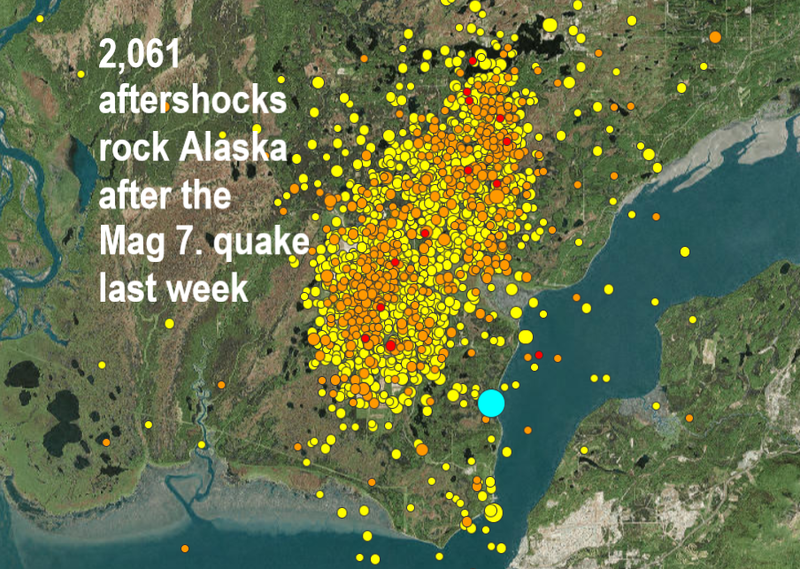 Incredibly more than 2,000 aftershocks have battered Southcentral Alaska since the powerful magnitude 7 struck four days ago, that works out at around 24 aftershocks per hour since the big one. According to 2KTUU, many of the aftershocks, which average between magnitude 2 to magnitude 4, are still strong enough to shake people from their sleep into Saturday morning, officials with the National Weather Service say that's normal for such a large quake. The biggest question on people's minds is; when will these quakes stop, and will any be similar in magnitude to the initial 7.0 shaker? Scientists with the Weather Service say that they'll stop gradually, and show a low probability chance of being high magnitude again. The powerful earthquake jolted southern Alaska on Friday morning, buckling roads, disrupting rush-hour traffic and jamming telephone service in and around Anchorage, the state’s largest city, but there were no reports of serious injuries. Shocking aerial images of shown the devastating impact the earthquakes in Alaska had on the roads and landscape. The tremors that struck the state on early Friday morning decimated stretches of road and made them impassible.